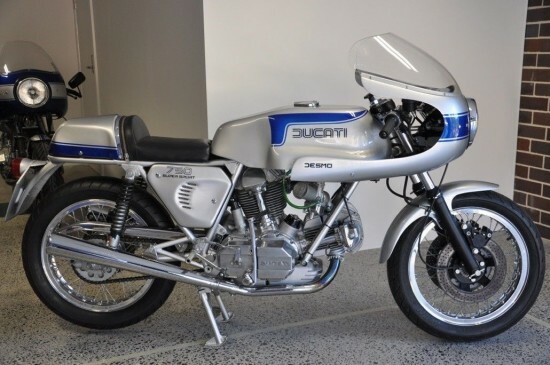 This beautiful 1975 Ducati 750 Super Sport came as a bit of a surprise to me. I was under the impression that all SS Ducatis were powered by the new 864cc engine from 1975 on, and that the 750 was basically discontinued, but that’s clearly not the case. And it’s obviously not simply a ’74 that’d been sitting around, since the square-case motor was introduced in 1975. 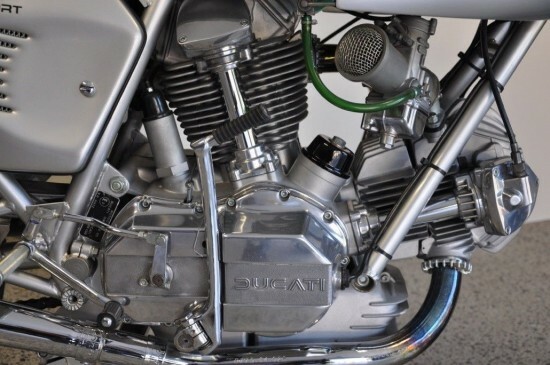 Turns out I was half-right: it appears that all Super Sports were based around the new 900 motor, with the 750 using a sleeved-down version to simplify manufacturing. Other than that, the two bikes were virtually identical in every way, including price. Obviously, most people opted for the 900 version, and sales of the 750 were basically nonexistent, except for certain markets like Australia and Japan. 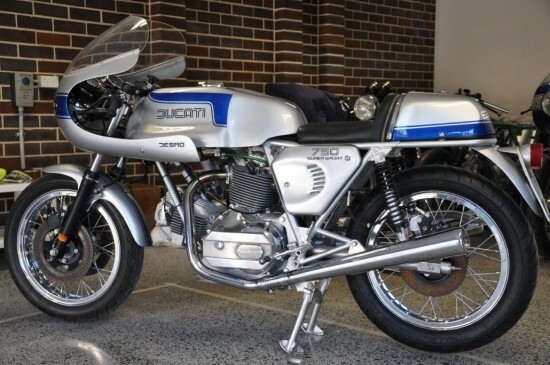 Excellent example of a rare classic collectable 750 Supersport, one of only 250 made. Basically I’m the third owner of this bike, I have had it over 12 years now. The history being original owner sold the rolling chassis to a racer friend and the motor to another. I inadvertently bought the race bike as a roundcase found the history and then chased to purchase the original motor. The original owner was a ’75 SS buff had no less than four 900’s and this lone 750 in his fleet. Most people preferred the 900’s over the little brother 750’s hence his reason for selling and parting the bike. The first squarecase 750SS was identified as engine number 075412 this is 075417 very early indeed. The frame number is DM750SS 075436 (the paintwork hides the numbers slightly but it is a genuine frame) It has the correct borrani rims and also has a pair of the very early 40mm dellortos’ without the choke castings. (Same as the greenframes and early 900SS’) most of the early numbered bikes had both, more often than not, probably due to limited production numbers, most ’75 model SS’ only had one – either the front or the rear. They are mounted on the standard steel manifolds particular to this model. 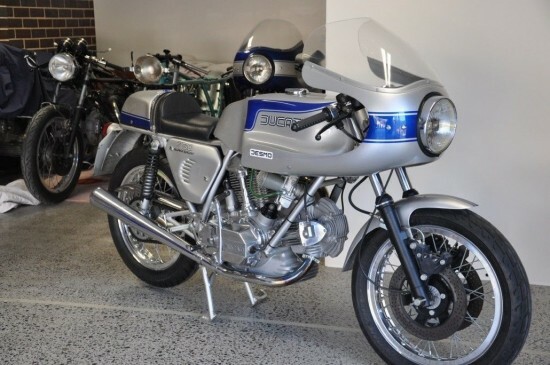 There were only 250 ’75 750’s produced by the factory making them very rare – fewer numbers of these were made to that of the greenframe ’74 models. Essentially the ’75 were made for racing there are specific stories relating to the building of these machines for production races. ’76 onwards they changed significantly, left foot gear change pattern, frame, tank, dash, carbies and manifolds, seat even was different and were built for general street purpose. More importantly after the ’75 model SS’s the motor’s were not scrutineered by the factory, they dropped the polished rockers and other finer details and attention to detail. The bike has been meticulously put back together, utilising all factory parts and it runs as good as it looks. The bore is original 80.0mm and the big end is new, it was replaced when the bike was restored. The speedo was re-set when the motor was rebuilt. 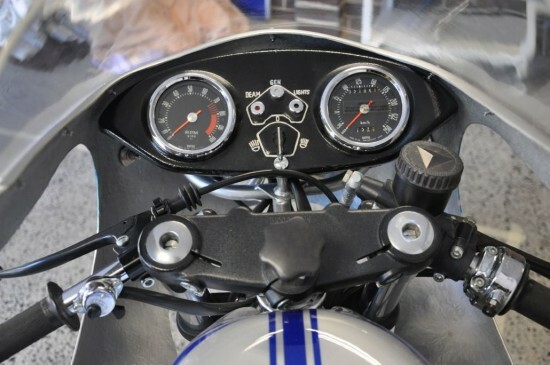 Actually true mileage is uncertain, irrelevant now as when the bike was rebuilt is was put back together using all of the correct factory parts. It needed nothing other than a set of rings and the big end was changed as a mere precaution whilst the engine was apart. The bike is located in Australia and the starting bid is $40,000 with no takers yet but plenty of time left on the auction. I’m assuming that eBay is doing the conversion into USD for us, but that’s still a big chunk of change. And while a round-case might be just that bit more desirable and a 900 just that bit more butch, this one’s beautiful condition might make it worth a look for collectors, especially those looking for something with just that little bit of extra rarity. Beautiful machine, just beautiful. Reverse the direction of the seat zipper and lose those little red Marzocchi stickers off the rear shocks and it’ll be even more choice. Last of the ducatis that really were racers with no pretense of being street legal. Right shift, no turn signals, basicly a bike built just to satisfy production racing rules. Looking at the pics, it looks like the seller has a ’74 green frame restoration going in the background. maybe he’s selling to fund that project?